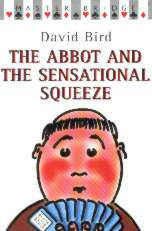 Synopsis: The Abbot and the Sensational Squeeze is the sixth title in the celebrated series about the bridge-playing monks of St. Titus. Brilliantly funny and filled with instructive bridge deals. The army of enthusiastic followers of the bridge-playing monks of St. Titus, and their sometimes less than admirable Abbot, will have a field-day with this brilliant new collection of stories. Each chapter sees the monks in some bridge situation where they play a number of hands. The theme focuses on the exploits of the monks in England, expanding to exploits of a missionary outpost in Africa.